So, can you tell a difference? No, I didn't get my hair cut. Wish I would've lost weight, but that bowl of ice cream and hot fudge won't help. And negatory on me wearing a new shirt! Now, I realize people take this differently. Some people are saddened by any thoughts of divorce. Some people actually have a divorce party. Others, like me, it's just another day in the neighborhood. I have to admit. I'm pretty happy and excited. The world is my oyster. Yes, it always has been, but there's been an Eeyore cloud hanging over me for years. This cord to my ex has now been severed and I can move on. It's been a long 5 yrs. Hopefully people can remember that when I tell them, "Hooray I'm finally divorced." Most people that I know in the flesh know my story. Of course they wish we could've worked things out. I guess in a perfect world, who wouldn't. Then again, in a perfect world, I never would've had a reason to get divorced. The judge...let's just say, she wasn't what I expected. Don't we all have preconceived notions on how things will probably be? Going to court, probably going to be a somber experience. No one really goes to court for fun and exciting things. Well, not in this court room. Our judge, she was kind of laid back. Brought in her green reusable coffee travel mug. Used the wrong names a few times and just laughed about it. She started reading through our info, realizing where we got married and asked us if we ever went to this one restaurant. She and my ex exchanged a few thoughts about the restaurant and we kept moving forward. She asked us all the questions she'd asked of the couples before us. Somehow or another we got back on the topic of the town we got married in and the lake the judge's family lives on. Turns out it's the same one the ex's family has a place on. Then they were talking about the 4th of July parade and the boat parade on the lake. Oy vey, was that really happening? I made eye contact with my friend and just laughed and plopped my head on the table. Yes, this is my life. This strange conversation should be expected. At least it was light hearted and not some gloomy and depressing situation. When it was all said and done, we were divorced in about 15 minutes. I know that if the ex ever wins the lottery or comes into a big inheritance I can never ask for it. I laughed. It's never been about money for me, but I know she has to ask. She did the same to the ex. I still haven't told my boys we're divorced yet. 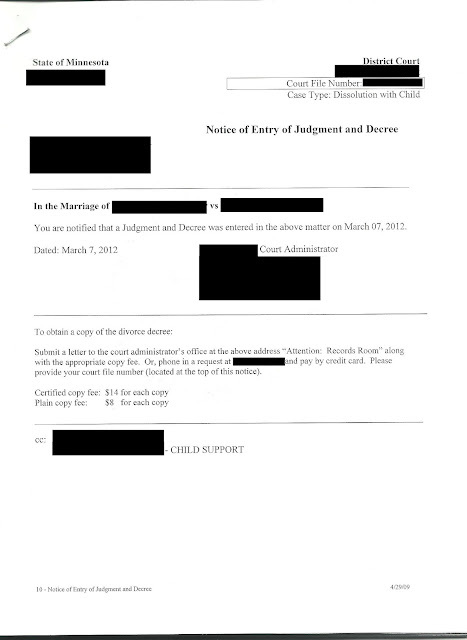 I wanted them to look back over the last couple of weeks and realize that our lives aren't going to change because a judge signed a piece of paper. They KNEW the divorce was coming, I just didn't go on and on about it or tell them the exact day. Kids worry too much as it is and I didn't want this to be something they carried around with them. I think I'll tell them this weekend. We have Spring Break coming up and it'll give them some down time to digest it all. Have you been divorced? How did you tell your kids? Was the courtroom a drama fest or was it as simple and "interesting" as mine? YAY! I'm glad it's over for you! You already know I am and I didn't really tell my kids at the time, because they were too young... both under 3 when he left and under 4 when everything was final. The actual divorce hearing was much like yours, but we did have a couple of more heated emergency hearings in the public "Monday morning roundup" as I like to call it... I imagine that's similar anywhere, because a friend just went through it down here and it was the same. I'm happy for you because it's clearly what you needed to move on. I most definitely didn't have the same sense of joy about it. I was pretty much out of commission for a few days. I could not stop crying. Horrible day in my book even though I was the one filing. Im so glad that you go everything taken care of! I can only hope that Court for me is as smooth as it was for you! Crossing my fingers..
Knowing some of your history with the ex, I can say that I am so happy for you! What a relief you must feel now :). Wow, thanks for sharing that story. Not that I know, but it must take tremendous courage to divorce when you have four kids. I've known a few women in similar situations, and not only did they survive, they thrived. Enjoy the journey. I don't know the whole story, but it sure sounds like this was the best decision for you. Your court story was funny! How ironic to talk about some happy memories during your marriage with the judge. Kinda odd. I've been divorced and it was the best for me and for my daughter. It took forever because my ex wouldn't accept the papers. He didn't show up for the hearing either.